Bangladeshi Cheese / Ponir / Paneer has its own flavour and style. In Bangladesh cheese (ponir) is made by fresh milk. But it is hard to find fresh milk in abroad. In that case you can use refrigerated milk, but you need bring it in normal temperature. Try not to use non pasturized/ homogenized milk. In Australia A2 is the only non pasteurized/ homogenized milk. Hope you will love the post. For help I am adding a video of it which is produced by Bangladesh Government. Also needs small bamboo basket (or strainer), knife and bamboo stick or skewer. Dissolve the rennet into the water and stir to dissolve. Pour milk into pot (no cast iron). Place over medium heat for 2 minutes to remove the coldness (if you have fresh milk omit this part). Pour the rennet solution and ½ teaspoon salt in milk and with a spoon stir it to ensure the solution is mixed well. (Note: one tablet works for 1-10 litres of milk). Then you need to keep the milk in a place for at least a couple of hours with no movement. Cut the cheese with a knife into square and with your hand crumb it. With your hand try to gather all cheese one side. Place in a bamboo basket and squeeze to strain excess whey. Let it rest 10-12 hours, add 1 teaspoon salt or to taste and with a stick try to insert inside. You can keep out Bangladeshi Cheese(ponir) 22-24 days outside in airtight container, 2 month in refrigerator and yearlong in freezer. Please read carefully your rennet instruction. You can use sour water (tok pani) instead of rennet tablet. To make sour water (tok pani) make mawa and milk together and rest for 10-12 hours to get sour water (tok pani). where i can get rennet tablet in dhaka? please let me know. Honestly Speaking I dont know where you get rennet tablet in Dhaka. Please try tok pani option. You will get tok pani any sweet shop which makes chhana. Thanks. Ami tok pani use korle ki melt hobe cheese? I mean mozzarella cheese er mtoi hobe ? And ami powder milk er mawa use korte parbo??? Hi. Rennet is not available in where i live. I think i’ll go with the tok pani option, but an u tell me what the proportion for mawa to milk should be to make tok pani? Searched for the recipe via goggle- no avail. Hi I am living in Sydney……can u pls tell me from where I can get rennet tablet. Pls reply me as soon as possible. I like this cheese very much. And ur website is very nice and helpful. Hi Tania ! reply keno korbo na!! I live Gold Coast , Queensland. I bought rennet tablet from online (ebay). Just search for vegetarian rennet tablet. Hope it will help. Thanks. I bought from ebay. So try on ebay. Thanks. Where should I buy those busket plz answer me.thank you very much. Ami rennet tablet ar jagay vinegar dite parbo???? Rennet jaygay tok pani dite parben. wow, I like this recipe a lot. I will definitely try this at home on my own. I like panir a lot. I have already learned a lot of panir recipes. rownak vi ami kulna thaki, amon kono jaega nai jekhane ai rennet tab khuji ni kintu boss onekei janei na rennet ki , amake plz bolben khulnar kothae pabo ? Boss, please try tok pani option. Please, what is mawa? I thought mawa was khoya. How does mixing mawa with milk produce tok pani? 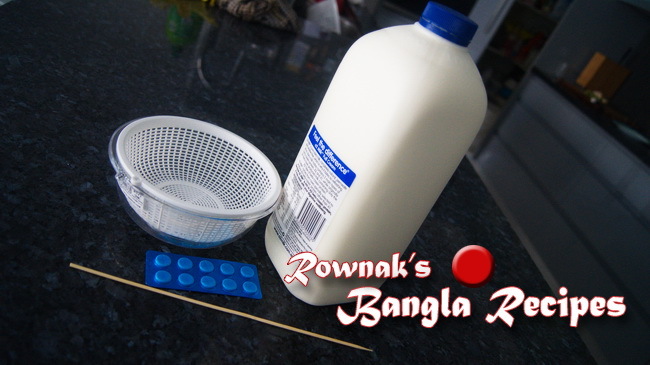 How much tok pani to use for making ponir with 2 liters of milk? I am writing from the U.S., and mawa is not something that is found in American supermarkets. Khoya is sold as mawa in Indian stores here. Thank you for replying, and thank you for posting this recipe and the video. If you live in USA, please try with vegetarian rennet tablet. You can buy online ebay or amazon easily. Mawa and Khoya are same things but sometimes Indian khoya made with milk powder for longer shelf life. Hope it will help. Thanks. Tok pani kivabe home e prepare korbo sei recipe ki share korben?and kototuku dite hobe cheese making e? hi. How much mawa and milk is suitable for the tok pani? Hi, I tried to make this twice but the milk didn’t set. I used 2.25 litres of pasteurised milk and one tablet of rennet (bought from Australia via eBay to the UK). Second time I used two rennet tablets but still the milk didn’t set. Does this recipe only work with unpasteurised milk (very difficult to get that in the UK)? Does it require the milk to set in a warm place? I made the cheese, but it does not have the aeration/bubbles like the Dhaka cheese. Also the only milk one can buy in Canada is pasteurized. Sorry, I dont know how to help in this case.When I make cheese, I get those bubbles. I have never tried with Pasteurized milk. Let me do some research, I will get back to you on this.